The Georgia Line was a formation within the Continental Army. The term "Georgia Line" referred to the quota of one infantry regiment which was assigned to Georgia at various times by the Continental Congress. The Georgia Line was unique within the Continental Army because the small population base of the state required that a large proportion of its recruiting be conducted outside the territorial boundaries of Georgia. The Line originated with the request by the Continental Congress on 4 November 1775 to raise a single Continental regiment that would be particularly responsible for defense of the Florida border and the seacoast, and would keep watch on the frontier. The Provincial Congress began to form the Line on 20 January 1776, but by the summer it began to request permission to recruit additional regiments in other states. Congress approved two additional regiments on 2 July, specifying that one should be armed with rifles. On the 24th of that month, Congress also approved the transfer to the Continental army of Georgia's four troops of horse and their expansion into a regiment of rangers who could serve on foot or mounted as the situation demanded. Congress added a final regiment on 1 February 1777. Of the five formations in the Line, the First Georgia Regiment and the Georgia Regiment of Horse Rangers were recruited in the state; the Second Georgia Regiment in Virginia; the Third Georgia Regiment in North Carolina; and the Fifth Georgia Regiment in Pennsylvania. All served exclusively in the south, and all were captured at Charleston on 12 May 1780. All but the First were officially disbanded on 1 January 1781. The remaining unit began reorganizing on 1 January 1783, after the British left Savannah, to become the three-company Georgia Battalion. It disbanded on 15 November 1783.
: NARA M246. These documents include muster rolls, payrolls, strength returns, and other miscellaneous personnel, pay, and supply records of American Army units, 1775-83. Authorized on November 4, 1775 in the Continental Army as the Georgia Regiment. The regiment was organized between January 20- 28 April 28, 1776 at Savannah to consist of 8 companies. It was assigned to the on February 27, 1776 to the Southern Department. Redesignated on July 5, 1776 as the 1st Georgia Regiment. Captured on May 12, 1780 at Charleston, South Carolina by the British Army. Redesignated on January 1, 1781 as the Georgia Regiment. Re-organized and redesignated 1 January 1, 1783 as the Georgia Battalion to consisted of 3 companies. Disbanded on November 15, 1783. The regiment would see action during the Southern Theater 1775-82. Authorized on July 5, 1776 in the Continental Army as the 2nd Georgia Regiment and assigned to the Southern Department. Organized in fall and winter of 1776 at Williamsburg, Virginia to consisted of 8 companies, recruited primarily in Virginia. Assigned on December 3, 1777 to the Georgia Brigade, an element of the Southern Department. Disbanded on January 1, 1781. Authorized on July 5, 1776 as the 3d Georgia Regiment and assigned to the Southern Department. The regiment was organized in the fall and winter of 1776 at Savannah to consist of 8 companies, recruited primarily in North Carolina. It was assigned to the on Dec 23, 1777 to the Georgia Brigade, an element of the Southern Department. Authorized on February 1, 1777 in the Continental Army as the 4th Georgia Regiment and assigned to the Southern Department. Organized in the summer and fall of 1777 at Philadelphia, Pennsylvania, to consist of 8 companies, recruited primarily Pennsylvania. Assigned on December 13, 1777 to the Georgia Brigade, an element of the Southern Department. Authorized in January 1776 in the Georgia State Troops as the 1st and 2nd Troops of Georgia Horse. The regiment was organized in spring 1776 at Savannah. Expanded in June 1776 to consist of the 1st, 2nd, 3rd and 4th Troops of Georgia Horse. Adopted on July 24, 1776 into the Continental Army; concurrently redesignated as the Georgia Regiment of Horse Rangers, assigned to the Southern Department and expanded to consist of 10 troops. 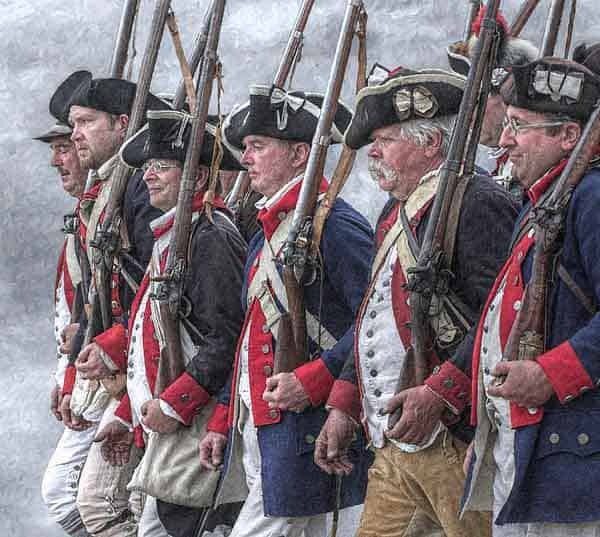 Re-organized on January 1, 1777 to consist of 12 troops. Georgia Final Payment Vouchers Index for Military Pensions, 1818-1864 These slips serve as an index to final and last payments to over 65,000 veterans of the Revolutionary War and some later wars. Georgia Revolutionary War Pensions Revolutionary War Pension and Bounty-Land Warrant Application Files. Georgia Revolutionary War Prize Cases - Captured Vessels Prize cases heard on appeal from Colonial and state courts by the Continental Congress and the Court of Appeals in Cases of Capture. Georgia Revolutionary War Rolls, 1775-1783 Muster rolls, payrolls, strength returns, and other miscellaneous personnel, pay, and supply records of American Army units, 1775-83. Georgia Revolutionary War Service Records Compiled service records of soldiers who served in the American Army during the Revolutionary War, 1775-1783.